The knee is the largest joint in the human body and a common source of athletic-related injuries. Classified as a pivotal hinge joint, the knee allows for straightening and bending in one direction, with some twisting (screw home mechanism). The knee joint is made up of bones, cartilage, ligaments, tendons, bursae, and meniscus. A injury to any one of these structures can cause knee pain. Osteoarthritis is a chronic inflammatory response of the knee joint resulting from deterioration to the articular cartilage (the protective covering of a bone) of the femur and/ or the hyaline cartilage (used for shock absorption) of the Tibia. The deterioration of cartilage becomes so severe that the joint space minimizes to the point where the two joint surfaces make contact. This direct contact between the two bones stimulates bone growth. This unwanted growth, causes further irritation to the bones which leads to pain that will alter your ability to walk and perform functional activities such as climbing stairs and rising from sitting. ​Osteoarthritis is considered a degenerative condition because it results from the wearing down of the cartilage on the ends of the bones over a period of time. However, it is possible to develop arthritis from an injury to the knee. Injuries can cause tearing of the meniscus (cartilage responsible for shock absorption) and/or tears to the protective covering on the end of the femur. Significant traumas such as fractures, patellar subluxations, patellar dislocations and ligament tears can speed up the arthritic process due to loss of normal mechanics of the joint. Other common contributing factors to osteoarthritis include obesity, muscle weakness, and genetic predisposition. ​Signs and symptoms of arthritis may include pain and stiffness around the joints, decreased ROM, swelling and clicking or popping also known as Crepitus. Typically the knee starts to hurt after being in one position for an extended period of time. Examples of this would be prolonged sitting (watching a movie or riding in a car) and sleeping. The pain typically improves with movement of the involved joint because of the lubrication that naturally takes place during joint motion. ​A diagnosis is typically made after having an x-ray but in some instances MRI or arthroscopy (knee scope) can be used to confirm the severity. These methods are used to see joint space narrowing in both sides of the knee. The medial compartment of the knee is more susceptible to arthritis due to the fact that more compressive forces are placed on that side of the joint. Osteophytes otherwise known as bone spurs can form along the joint line. Osteophyte formation is the body’s attempt to naturally stabilize the degenerative joint. ​Treatment for arthritic knees usually consists of physical therapy, taking NSAIDS, weight loss and possibly using a cane or walker. In some instances a knee brace can help unload the painful aspect of the joint. The ultimate goal of physical therapy is to help reduce pain and promote an improvement in function. Improving ROM and strengthening the muscles in the hips and the muscles that directly stabilize the knee will help to disperse forces and promote stability that will improve balance and reduce pain. Physical therapy will not decrease the amount of arthritis but may help improve the mechanics of the knee and control of the hip and ankle to decrease pain. Other treatments include lubricant injections, steroid injections and joint replacement surgery. ​When conservative treatment has failed, total joint replacement surgery is usually the next step. Arthroscopic debridement (to clean up the joint space) may be an option but recent research has not shown favorable results for this procedure. Total joint replacement surgery is very painful and recovery can be difficult. The surgery is very successful at improving pain and function but the rehab process after the surgery is crucial in helping the patient to achieve desired goals. The rehab process is also painful and long due for total knee replacement. Early on in physical therapy we focus our attention more on restoration of motion. There is a finite window of time that the motion can be restored after total knee replacement. Secondary emphasis is placed on strengthening of the knee and hip once we are comfortable the motion is progressing. It will likely be 6 months before the patient will be able to return to all activities and sometimes up to a year before the maximum benefits are realized from the surgery. ​The knee is a very important joint in the human body, which is why any injury to this structure can tremendously reduce a person’s activity level. A common knee injury, among all ages and activity levels, is damage to the cartilage of the knee – particularly a specific type of injury called a meniscus tear. ​The knee is a joint comprised of the interaction of two large bones, the tibia and femur. Along with a smaller bone called the patella or kneecap, they comprise the bones of the knee. The femur is the large bone that runs from the hip to the knee, and the tibia is the large bone that runs from the knee to the ankle. The point at which these two bones join, or articulate, is the knee joint. As the knee flexes and extends, there are multiple types and locations of cartilage that prevents wear and tear on the bones during the impact of daily activity. We will now focus on the two “shock absorbing” structures known as the medial and the lateral meniscus. They are located on the top of the tibia, on a flat location called the tibial plateau. They are shaped like a forwards “C” (medial) and a reverse “C” (lateral), and they surround the attachment sites of the ACL and PCL. Their purpose is to reduce friction between the tibia and femur during normal joint motion. If you can picture the end of a chicken drumstick, and the smooth gristle that covers the bone, then you have an excellent idea of the feel of the meniscus. ​When the knee is moving normally, the femur and tibia glide across each other with little or no friction. This normal, fluid motion can be interrupted if the menisci are damaged. Excessive twisting of the knee while it is bent, or damage to one of the ligaments of the knee, can cause a meniscus to be caught between the tibia and femur and a tear to occur. The most common location of a tear is in the posterior portion of the medial meniscus. ​Tearing a meniscus can be painful and can result in the knee “catching” during the transition from a flexed to extended position. This occurs when the torn parts of the meniscus interfere with the tibia-femoral motion. The torn meniscus can cause a “block” that will prevent a person from fully extending or flexing the knee. Pain along the joint line, swelling, increased skin temperature, popping sensation in the joint, or an audible clicking can all be symptoms of a torn meniscus. The size of the tear and its location will determine whether it needs to be surgically repaired, debrided (removal of torn section), or left alone. Since the main source of the blood supply to the meniscus is found along its outer edge, this can play into the decision on whether to repair or remove the affected portions due to healing being slower or non-existent along the inside of the meniscus. Small tears are sometimes left alone, but tears larger than one centimeter will usually need to be addressed surgically. The vast majority of arthroscopic meniscal surgeries involve a debridement, as repairs are usually performed in younger, athletic populations. ​Since a meniscal tear can interfere with knee function, evaluation by a medical professional is appropriate to determine the best course of treatment. Common tests involve manual testing of knee motion, x-ray imaging or an MRI. For a great majority of meniscus tears, arthroscopic debridement is the gold standard in addressing this issue. This involves surgical removal of the torn fragments of cartilage via small surgical tools through small openings in the knee. A camera is placed through one hole for visual inspection of the joint surfaces and surgical tools are placed through the other opening for probing and removal of the affected cartilage. This is typically a minimally invasive procedure and the patient usually can go home that very day. For low activity jobs, a person can usually return to full duty within a week, though more physically demanding jobs may require several weeks before the patient is ready for the demands of the job. Athletes who have this done may take weeks to months to recover to full strength, depending upon the severity of the injury and the demands of their particular sport. ​Returning to sport or activity is important after any surgery, and this is where physical therapy can be most beneficial. After surgery to the knee, there can be a decrease in a person’s strength, flexibility, stability, and balance. Since part of the cartilage has been removed, it is important to improve these deficits since the chance of arthritis in the joint can increase with removal of more than 20% of the meniscus. The best course of action is to use physical therapy to assist with returning those deficits back into strengths. As its purpose is to return the patient to their prior level of function, a specific PT plan of care is created for each patient, based on their goals after surgery. Generally, the first week of therapy after an arthroscopy is focused on decreasing pain and swelling, and starting gentle strengthening and motion to the knee. As the patient progresses, the focus can include increased strengthening of the musculature around the knee, balance and proprioceptive exercises, and stretching for the knee. A home exercise program will also be implemented to assist with maintaining gains acquired during therapy. Normally, a person can return to their prior level of activity within two months after surgery. ​One of the most prominent and news making stories usually involves the athlete who tears their anterior cruciate ligament during competition. The anterior cruciate ligament (ACL) is often the subject of comeback stories at all levels of sports. ACL injuries are very common and well over 100 thousand occur every year. This injury is not confined to sport alone but can occur as a result of a twisting motion to the knee in a number of work and otherwise leisurely settings. This type of injury knows no boundary with respect to gender or age. Studies do reveal that women tear their ACL’s at a rate of 4 to 6 times greater than men. There is much debate as to the reasons why females are more susceptible. Ligaments join bone to bone in our musculoskeletal system. The ACL originates on the posterior or back side of our distal femur or upper leg bone and attaches to the anterior aspect or front of the tibia or lower leg bone, thus the name Anterior Cruciate Ligament. This ligament provides stability in the anterior plane as well as the rotational planes of movement involving the actions of the two major leg bones. This ligament works in conjunction with other major knee ligaments as the posterior cruciate and the medial and lateral collateral ligaments to provide necessary support allowing us to move and perform all motions of the knee as needed for work and leisure. ​Injuries to the ACL occur as a result of a twisting motion to the knee with the foot in fixed position or in contact with the ground. The usual mechanism of injury involves a decelerating activity accompanied with a twist or pivot of the fixed leg. This can include a cutting activity or even a landing activity, where the upper leg continues to move or pivot over the fixed or planted leg. A hyperextension or excessive back knee position may also contribute to this mode of injury. It is intriguing to note that the majority of these injuries occur in a non-contact fashion as opposed to a direct force or blow to the knee by an opponent in a sport situation. ​ACL injuries present with several common and key signs and symptoms. In most cases people describe that they felt a “pop” in their knee. In addition to pain, many describe a nauseous feeling as a result of the twisting motion. The knee will usually begin to swell relatively quickly with what we call an effusion. This is due to blood and fluid in the joint. The degree of functional ability after such an injury varies. Some people can get to their feet and walk, however many are incapacitated and cannot. Many will immediately realize that their knee feels unstable if trying to move or walk. This is a very common occurrence. Quite often an ACL injury can be accompanied by damage to other surrounding structures such as the collateral ligaments and/or the medial or lateral meniscus. When a combination of injured structures is present, the signs and symptoms are more prevalent and the pain which accompanies the injury tends to be increased. ​If one suspects that they have an ACL injury, a prompt examination by your orthopedist or physical therapist is highly recommended. Most knee injuries of this type are identified with a clinical diagnosis. Usually an X-RAY is taken to rule out any bony problems that may exist. This is followed by a physical examination to assess the degree of motion, effusion or swelling. Specific knee tests will be performed to determine the type of injury and the degree of instability, if any, that may be present. In many cases, your doctor may want to obtain an MRI to identify all the structures that are involved and to what extent they may be injured. Very seldom does one suffer a partial tear of the ACL. The force that produces the tear is usually sufficient enough to completely disrupt the structure. ​Once the extent of the injury is determined, your doctor will discuss with you the injury management options and subsequent courses of action that are available. The knowledge and information gained from consulting your orthopedist will allow you to make an informed and intelligent decision as to what option is best in your particular case. These may include but are not limited to the following options. Your lifestyle may allow you to perform all activities of daily living with a knee that may have a degree of instability. You may choose to forego reconstructive surgery and try to continue with a knee that has undergone some specific rehab that allows you to perform all activities as needed. However, if one wants to lead an active lifestyle and continue to participate in activities that require a stable knee, reconstructive surgery is the treatment of choice. This option will be outlined by your surgeon. Prior to surgery, your doctor may want you to undergo a period of rehabilitation to restore knee motion and some measure of quad strength to prepare you for the impending recovery process. ​Surgical options include a reconstruction of the torn ACL. This surgery will require a tendon graft which is used to reconstruct the ACL in an anatomical position that provides the needed support to allow one to return to their previous level of activity. Grafts used for ACL reconstruction are from three primary sources. Many surgeons choose to use your own tissue as an ACL graft. This is accomplished by using (1) your patellar tendon from the same knee or on occasion the opposite knee or (2) a section of hamstring tendon from the same knee or on occasion the opposite knee. The third option is to use a donor graft from a cadaver for the reconstruction process. Your orthopedist will discuss the specific grafts and the advantages and disadvantages of each. The choice of graft will depend on several options such as age, activity goals, and individual surgeon preference. ​Once a person undergoes an ACL reconstruction, a period of specific, intense rehabilitation follows. Rehabilitation of an ACL reconstruction is a process that lasts for a period of several months. It may take from 6 to 9 months of rehab to ensure that one is able to resume full activity of work and leisure or competitive sports. The rehab process following ACL surgery will follow a plan that is time and activity dependent. Specifics will vary depending on the type of graft used and whether other structures such as different ligaments or cartilage are part of the surgery process. After surgery, your doctor may require you to wear a post- op brace for perhaps up to 6 weeks to guard the surgical leg as rehab and recovery begins. The early phase goals of rehab after surgery include restoration of motion and weight bearing status as well as baseline strength consideration. As one progresses, emphasis will be placed on enhancing strength and power of all muscle groups as well as restoring balance, coordination, agility and overall endurance. A variety of functional and sport-specific exercises and activities are used to help return the individual to pre-injury/surgery status. Ultimately, one will be required to successfully complete a series of functional sports tests or job specific tasks. These are used to reinforce rehab goals and to allow for safe return to pre-injury/surgery activity levels. On occasion, your doctor may want you to wear a functional (“sports”) knee brace for a period of time. These types of braces can help in gaining confidence with increasing activity demands and provide extra support as dynamic activity intensities are increased. Remember that everyone progresses at different rates for a variety of reasons and your particular timetable may be different from others. ​ACL reconstruction has become a common orthopedic procedure and the surgical expertise continues to improve. However, this is a major knee surgery and diligence should be taken to follow all instruction and rules set forth by your doctor and physical therapist. Pre and post –operative rehabilitation guidelines must be followed to insure that you have optimal results. Full return to previous activity is entirely possible and should be the goal of all rehab programs. ​The knee is certainly an important joint in the human body, which is why any injury to this structure can tremendously reduce a person’s activity level. A common knee injury, among all ages and activity levels, is damage to the cartilage of the knee – particularly a specific type of injury called a meniscus tear. This article will attempt to describe the anatomy of the knee, the purpose of arthroscopic surgery for a meniscus tear, and the rehab process that can follow. ​The knee is a joint comprised of the interaction of two large bones, the tibia and femur. The femur is the large bone that runs from the hip to the knee, and the tibia is the large bone that runs from the knee to the ankle. When these two bones join, or articulate, the knee joint occurs. Along with the patella, (the kneecap), they comprise the bones of the knee. Holding everything together are tendons, which attach muscle to bone, and ligaments, which attach bone to bone. The four major ligaments in the knee are the anterior and posterior cruciate ligaments (ACL and PCL), and the medial and lateral coronary ligaments (MCL and LCL). The ACL and PCL are found inside the knee joint, attaching the tibia and femur together in an X shape, as they prevent excessive forward (ACL) and backward (PCL) movement of the femur on the tibia during normal flexion and extension of the joint. The MCL is found on the medial portion of the joint, attaching the femur and tibia, and it prevents excessive medial (motion towards the midline of the body) movement of the knee joint. On the opposite side of the knee, is the LCL, which attaches the femur to the tibia and prevents excessive lateral (motion away from midline) movement of the knee. ​As the knee flexes and extends, there are multiple types and locations of cartilage that prevents wear and tear on the bones during the impact of daily activity. The two that we are focusing on are the medial meniscus and the lateral meniscus. They are located on the top of the tibia, on a flat location called the tibial plateau. They are shaped like a forwards “C” (medial) and a reverse “C” (lateral), and they surround the attachment sites of the ACL and PCL. Their purpose is to reduce friction between the tibia and femur during normal joint motion. If you can picture the end of a chicken drumstick, and the smooth gristle that covers the bone, then you have an excellent idea of the feel of the meniscus. When the knee is moving normally, the femur and tibia glide across each other. However, this motion can be interrupted if the menisci are damaged. 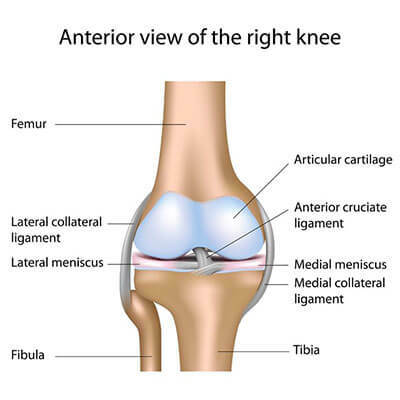 Excessive twisting of the knee while it is bent, or damage to one of the ligaments of the knee, can cause a meniscus to be caught between the tibia and femur and a tear to occur. The most common location of a tear is in the posterior portion of the medial meniscus. ​Tearing a meniscus can be painful and can result in the knee “catching” during the transition from a flexed to extended position. This can be from the torn parts of the meniscus interfering with the tibial-femoral motion, and can prevent a person from fully extending or flexing the knee. Pain along the joint line of the tibia and femur, swelling, increased skin temperature, popping sensation in the joint, or an audible clicking can all be symptoms of a torn meniscus. The size of the tear and its location will determine whether it needs to be surgically repaired, debrided (removal of torn section), or left alone. Since the main source of the blood supply to the meniscus is found along its outer edge, this can play into the decision on whether to repair or remove the affected portions due to healing being slower or non-existent along the inside of the meniscus. Small tears are sometimes left alone, but tears larger than one centimeter will usually need to be addressed surgically. The vast majority of arthroscopic meniscal surgeries involve a debridement, as repairs are usually performed in younger, athletic populations. ​Since a meniscal tear can interfere with knee function, evaluation by a medical professional is appropriate to determine the best course of treatment. Common tests involve manual testing of knee motion, x-ray imaging or an MRI. For a great majority of meniscus tears, arthroscopic debridement is the gold standard in addressing this issue. This involves the surgical removal of the torn fragments of cartilage via small surgical tools through small openings in the knee. A camera is placed through one hole for visual inspection of the joint surfaces and surgical tools are placed through the other opening for probing and removal of the affected cartilage. This is typically a minimally invasive procedure and the patient usually can go home that very day. For low activity jobs, a person can usually return to full duty within a week, though more physically demanding jobs may require several weeks before the patient is ready for the demands of the job. Athletes who have this done may take weeks to months to recover to full strength, depending upon the severity of the injury and the demands of their particular sport. While an injury to the meniscus can be infuriating for the person attached to the knee, surgery and subsequent physical therapy can assist with returning that person back to their previous activity level. If this type of injury has occurred to you, make sure to get it evaluated by your medical professional, so as to bring you back to your daily routine as quickly as possible. Then, consider physical therapy as a viable way of returning your knee back to full function. Your knee will thank you. “Week-end Warriors” and athletes of all types and skill levels can struggle with knee pain. Even without a major injury, knee pain can sideline the most dedicated of athletes. The most common cause of knee pain in athletes is patellofemoral syndrome. This is a condition in which the kneecap (patella) does not track normally in the groove of the femur (trochlea). This leads to pain in the front of the knee, especially when loading the patellofemoral joint while going up and down stairs, kneeling, and squatting. Many will experience a “dull, achy” pain when sitting with a bent knee for long periods of time. This type of pain, which occurs while riding in an automobile, airplane or watching a movie is medically termed “theatre sign”. Most cases are caused by two things: 1) Subtle imbalances (weakness) in the muscles that control the patella, in particular the quadriceps muscle 2) Poor flexibility of the muscles surrounding the knee including the quadriceps, gastroc and most importantly the hamstring. We now also know that weak hip muscles can contribute to the problem as well. In the past, this condition was often called chondromalacia patellae, but this name would indicate that there is arthritis under the patella, which is not necessarily true in all cases. Patellofemoral syndrome typically affects adolescents and young adults. Knee problems in older populations are more commonly caused by arthritis. Women are twice as likely as men to develop patellofemoral pain. This may be because a woman’s wider pelvis increases the angle at which the bones in the knee joint meet (Q Angle). Females also tend to have weaker quad and hip musculature which definitely pre-disposes them to PFS. Most cases of patellofemoral syndrome resolve with non-surgical treatment. Treatment of patellofemoral pain often begins with simple measures. Rest your knee as much as possible. Avoid any activities that increase the pain, such as using stairs, kneeling, squatting and prolonged sitting. Patellofemoral syndrome is treated with physical therapy to re-balance the muscles that control the patella. A physical therapist will prescribe specific -rehabilitation exercises that will strengthen the muscles that support your knees and control limb alignment, such as your quadriceps, hamstrings and the muscles around your hips (especially the hip abductors). Stretching exercises will also be a staple of the program in those athletes that are tight. Most individuals (athletes included) do not stretch enough so this often becomes a focal point of the treatment along with strengthening. Icing the knee after exercise can be especially helpful as well. Knee braces and/or orthotics are sometimes used to protect the joint and improve the alignment of the kneecap. Anti-inflammatory medication (Ibuprofen: Advil-Motrin IB or Naproxen: Aleve) can be used to help decrease inflammation. During your recovery, you may want to restrict your activities to sports that are easier on the knees — such as bicycling and swimming.